Why Should You Pin a Seam? "Pin the seam" is one of the most repeated instructions when you are following a sewing pattern. Although this is a simple process, there are things you need to keep in mind when you are pinning a seam. Pinning a seam or other sewing detail is done to temporarily hold the layers of fabric together before they are sewn together. Pinning a seam takes care of holding the fabric together and allows you to see if one or the other of the layers of fabric is stretching or becoming distorted. Pinning the fabric into position leaves you free to concentrate on controlling the sewing machine as long as the pins are placed properly so you won't damage your sewing machine. Pinning a seam allows you to evenly distribute easing or gathering. Pinning is essential to match seam intersections and other sewing details, such as pattern dots. Lay the pieces of fabric on a flat surface and line up the ends of the seam and the edges of the fabric. Be sure the ends line up and both layers of the fabric are laying flat and smooth. Match seams that intersect and any pattern markings that have been transferred to the fabric. Place pins perpendicular to the raw edge of the fabric, keeping the pins further back than where the seam stitching will be when the seam is sewn. Spacing the straight pins is a variable. Fabric that stays together will need less pinning, or pins that have more space between them, than a slippery fabric which will need many pins with the pins close together. The more details that there are to match the more straight pins you will need. Do not sew over pins! Sewing over pins can damage the sewing machine needle and the sewing machine itself. The damage to your sewing machine needle can snag or damage your fabric. It can cause poor stitch quality, skipped stitches and it can cause thread jams, which leads to sewing machine issues. The damage to your machine is the same as the damage you could cause to your car if you continually ran over potholes or hit speed bumps without slowing down. It may take time for the damage to become a problem but eventually, you are going to have a problem. Most newer sewing machines are made of plastic parts and those parts are going to become jammed, loosened, and timing will become off. It is not worth what the possible consequences of sewing over straight pins can do to your sewing machine. Continue lining up the edges, matching dots and seams when needed and pining in place for the entire length of the seam. If the seam lays flat but the ends do not line up, double check your cutting or measurements. If there are dots to match, make sure the dots are aligned. You may also have inadvertently stretched one of the layers of fabric. In which case you will need to go back and ease the layers of fabric to make them even. As you are sewing the seam if the pins are in the seam line and would be run over by the sewing machine, remove the straight pins as you come to them so that you do not run over them. If you do run over a straight pin with your sewing machine, check the sewing machine needle for damage and be sure your stitches are still correctly formed. Most sewing machine gears are held in place by a set screw against the shaft that the gear rides on. The more times you hit a pin, the more likely you are to loosen those set screws and lead to eventual sewing machine problems. Sewing over pins also damage the straight pins so eventually the straight pins will need to be replaced so they aren't snagging your fabric when you use them. 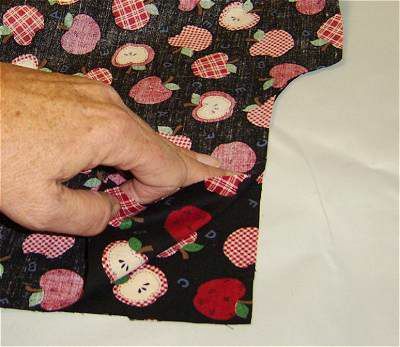 If your fabric is extremely slippery, you may need to hand baste the seam even if your pin the seam, so that the fabric is held in place closer to the seam line without having to worry about pins being sewn over.